BUENOS AIRES, Argentina — The head of the Sochi Olympics has asked the IOC to help "stop this campaign and this speculation" related to the anti-gay law that has been overshadowing preparations for next year's Winter Games in Russia. A senior IOC member, meanwhile, said sponsors were "afraid" of the fallout of possible demonstrations in Sochi. "I think this could ruin a lot for all of us," marketing commission chairman Gerhard Heiberg said. "We have to be prepared." IOC president Jacques Rogge said the Olympic body would remind athletes to refrain from any protests or political gestures during the Feb. 7-23 Sochi Games. Sochi organizing chief, Dmitry Chernyshenko, was asked at the IOC general assembly about the possible impact of the legislation that bans gay "propaganda." He said Sunday that the Russian government had made clear that the law would not affect the games, and he urged the IOC to convey the message to "those who are still trying to speculate on this very transparent and very clear topic." "It's very important to have your support to stop this campaign and this speculation regarding this issue," Chernyshenko said. Russia's law prohibiting promotion of "nontraditional" sexual relations has been denounced by activists and criticized by U.S. President Barack Obama. Activists have called for a boycott of the Sochi Games, although Obama and British Prime Minister David Cameron have ruled that out. Chernyshenko reiterated that the law does not ban homosexuality in any way and "doesn't contradict any element of the Olympic Charter." He noted that President Vladimir Putin had given assurances that the Russian constitution "guarantees the equality of rights and freedom for everybody" in the country, including guests, visitors, athletes, fans and the Olympic family. "We are absolutely confident that there will be no conflicts in that regards," he said. "It will not stop [Sochi] 2014 from proudly upholding the Olympic values, I promise you." Rogge said the IOC was satisfied with Russia's explanations of the law so far. "The constitution of the Russian federations allows for homosexuality," he said. "And we have received strong reassurances that this law will not affect participants in the Sochi Games." 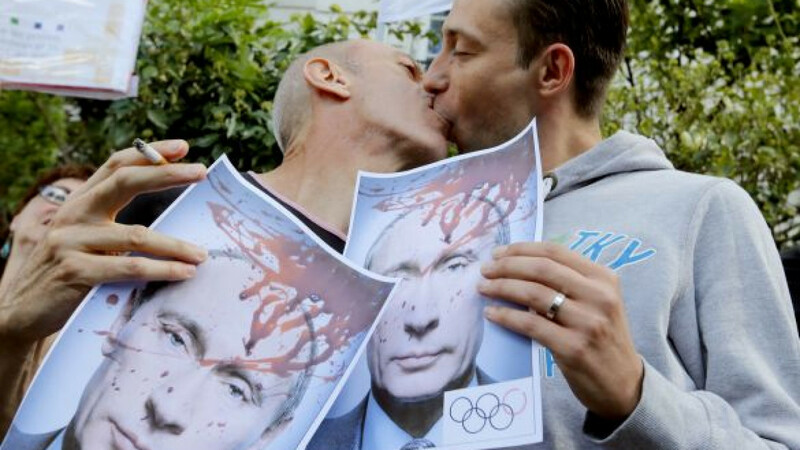 Chernyshenko cited comments by Putin in a recent interview in which he sought to ease concerns that the law would be used to punish athletes who displayed rainbow flags during the games, while insisting that gays were not discriminated against in his country. "I assure you that I work with these people, I sometimes award them with state prizes or decorations for their achievements in various fields," Putin said. The law, which Putin signed in July, makes it illegal to expose minors to information that portrays these relationships as normal or attractive. The law imposes fines, while also subjecting foreign citizens to up to 15 days in prison. Putin has no intention of allowing a gay pride parade during the Olympics. He recently signed a decree banning all demonstrations and rallies in Sochi throughout the Winter Games. IOC spokesman Mark Adams said athletes were allowed to express themselves before the Olympics and outside the games' venues, or even in news conferences. But he said the IOC does not want the games themselves to be used as a platform for demonstrations. Adams was not clear about whether athletes would be subjected to punishment if protesting outside the venues. "It's obviously Russian law," he said. "What we have is from the deputy prime minister and more recently from the president, absolutely undertaking [that] the law will not affect spectators, athletes or anyone else attending the games. Now, how that works in practice, that's something for the Russian authorities to work out." Heiberg raised the issue of concerns among sponsors. "Lately, there has been a lot of discussion, especially in Western Europe and in the United States, and I'm being pushed by several of the sponsors asking what will happen with this new law in Russia in connection with the gay community," he said. "We are not to try to change anything over the laws in Russia. We will, of course, accept this as internal Russian decision. But what will the consequences be?" Heiberg cited Rule 50 of the Olympic Charter, which says "no kind of demonstration or political, religious or racial propaganda is permitted in any Olympic sites, venues or other areas." "We have to be prepared," he said. "We can see many ways this could happen. I heard a lot from the sponsors, especially the American sponsors, what they are afraid of could happen."